Four pine twigs stitched onto linen (7 threads per centimetre), approx. 16 x 78 centimetre. The coarse canvas is stitched with two threads (DMC) or one thread (Dansk Blomstergarn). This makes the subject more airy. I stitched the table runner with black and silver. The pattern is available as a PDF download. 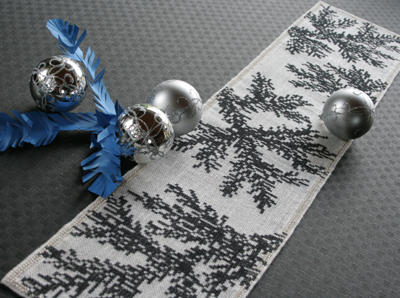 This entry was posted in Free Patterns and tagged christmas, tablecloth by admin. Bookmark the permalink.